For reference monitoring applications in the Broadcast industry, Sony's leading edge Organic Light-Emitting Diode (OLED) technology and signals processing technology ensures absolutely outstanding performance with the BVM-F170. Super Top Emission technology enhances OLED's intrinsic benefits to deliver outstanding black performance, a quick response with virtually no motion blur, and a wide colour gamut. An all-new 12-bit output digital signal processing engine provides a nonlinear cubic conversion colour-management system that delivers precise colour reproduction, stunning picture uniformity, smoother-than-ever gamma performance, and picture quality consistency. Sony's Super Top Emission™ technology has a micro-cavity structure which incorporates colour filters. The micro-cavity structure uses an optical resonance effect to enhance colour purity and improve light-emission efficiency. In addition, the colour filter of each RGB further enhances the colour purity of emitted light, and reduces ambient light reflection. 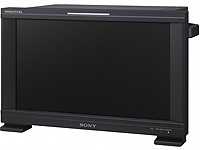 The BVM-F170 monitor can accept almost any SD or HD video format, both analogue and digital, and variable computer signals up to 1920 × 1080. In addition to the standard inputs, four option board slots are offered to configure this monitor according to different user needs. This monitor is equipped as standard with two 3G/HD/SD-SDI inputs, an HDMI (with HDCP) input and a DisplayPort for future expansion. In addition, four option ports are available. By installing the optional BKM-250TG 3G/HD-SDI input adaptor*, the BVM-F170A can support a variety of 3D signal analyses. The 3D signals* are displayed in 2D mode. The BVM-F170 monitor uses a sophisticated I/P conversion technique that keeps artefacts that are often seen in flat panel displays to a minimum such as edge jaggedness, conversion errors,etc. The BVM-F170 display engine ensures a picture delay that is less than one field. Every BVM-F170 monitor is carefully calibrated at the factory on an individual basis, providing a high level of accuracy and stability for characteristics such as gamma and uniformity. Using a colour feedback system, the BVM-F170 monitor achieves the stability required for broadcast critical monitoring applications. Two images can be displayed Side by Side to provide users with enhanced operational flexibility. A separate control unit BKM-16R is available for the BVM-F170. It is equipped with a Memory Stick socket enables users to download and save all monitor set-ups such as input channel configuration, control preset adjustments, white balance settings and maintenance parameters. Mapping the pixels of the signal to the panel to one-to-one mode, or displaying an SD signal of nonsquare pixels (the number of H pixels of the signal system is 720 or 1440) or a 640 × 480 SD signal of HDMI video by scaling processing of doubling for the V direction and correct aspect ratiofor the H direction and also optimizing and sidplaying a picture by modifying the aperture coefficient value, filter coefficient value, etc.